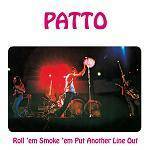 More information: A newly re-mastered and expanded edition of the classic 1972 album by the legendary Patto, Roll ‘Em, Smoke ‘Em, Put Another Line Out. One of the truly great bands of the early 1970s, Patto featured a line-up comprising Mike Patto (vocals), Ollie Halsall (guitar, vibes, keyboards, vocals), Clive Griffiths (bass) and John Halsey (drums). The band arose from the ashes of the group Timebox and were graced by the presence of the stunning guitar playing of Ollie Halsall and a highly original and unique musical style that set them aside from their Progressive Rock contemporaries of the era. This, the band’s third album, was released in 1972 and featured classic tracks such as ‘Flat Footed Woman’, ‘Singing the Blues on Reds’, ‘Loud Green Song’ and ‘Turn Turtle’. This Esoteric Recordings edition of Roll ‘Em, Smoke ‘Em, Put Another Line Out has been fully sanctioned by all members of the band and their representatives (for the first time ever) and includes three previously unreleased bonus tracks taken from a BBC Radio One John Peel show session from 24th January 1973. This expanded edition includes an illustrated booklet with an essay by Sid Smith and an exclusive interview with John Halsey.